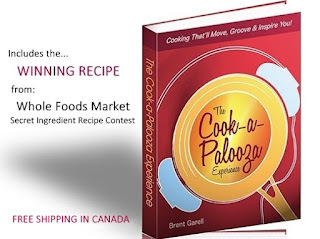 The Cook-a-Palooza Experience: Cajun Cooking to a Retro Beat! Cajun Cooking to a Retro Beat! This past Valentine’s Day I was determined to take a break from the kitchen and not cook. Guess what I ended up doing? The cooking bug struck while I was flipping through Chef Olaf Mertens’ cookbook called Olaf’s Kitchen. I had briefly met Chef Mertens at a book trade show and was fortunate enough to obtain a signed copy of his book. 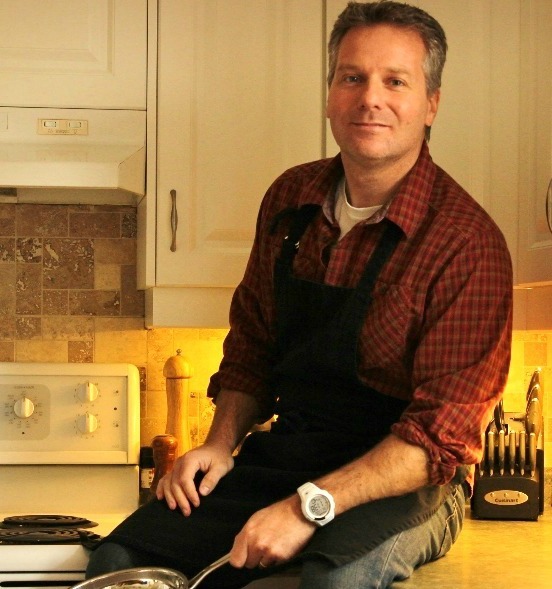 I also had the opportunity to chat with him about cooking and the challenges of writing a cookbook. Although he is a master chef and my abilities don’t even come close to the skills he possesses in the kitchen, he still treated me like an equal. My first impression of Olaf…about the nicest guy you could meet! I had only tried a few of his recipes and I wanted to dive further into his cookbook to try another. 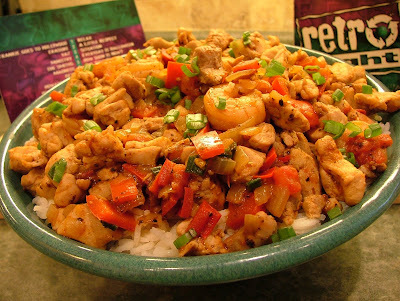 One recipe that interested me was a Cajun style dish that included chicken and shrimp. The challenge for me was the first ingredient. Sausages. I'm not able to use them in my cooking because my wife's stomach is very sensitive to them. Very bad things happen when she eats them. Oh the stories I could share...but let's move on. I also had to find an alternative for the bourbon. The challenge was to find creative alternatives for these flavorful ingredients I had to omit. When I’m looking for creativity in the kitchen I fill it with the melodies of music. For this occasion I choose a retro compilation CD that included a few of my favorite ‘80s new wave tunes. Perfect!! With the mood set I began to cook. I originally thought I would make up for the sausage flavor by adding fennel, which is a dominant flavor in sausages. I then turned my attention to cilantro and determined this would be a better way to go as it would compliment the existing Cajun flavors in the dish. It’s always a total crapshoot when you play with someone else’s recipe (especially a master chef’s) and begin adding your own ingredients. However I was feeling confident everything would work out fine as songs by Scritti Politti, Yaz and Erasure spurred me along. Chef Mertens serves this dish over risotto however I wasn’t about to put in that much tender loving care into this dish as I wasn’t expecting to be cooking in the first place. Instead I made a basmati rice using chicken stock and some butter. The final result was surprisingly good but the sausage and bourbon would have added the kick this dish needed to put it over the top. I’ve tasted some of Chef Mertens’ food and it is out of this world! I’m positive if I followed his recipe as written this would have been the same. The recipe below may not be “The Perfect Way” to make this dish but it fit the “Situation” and it packs enough flavor to deserve “A Little Respect”. In a large skillet, heat oil over medium-high heat. Add chicken. Cook and stir until chicken is completely cooked and begins to brown. Transfer chicken to a medium bowl and set aside. Reduce heat to medium. Add butter and onions to skillet. Cook until onion begins to brown. Add red pepper and shrimp. Cook until shrimp turns orange, about 3 minutes. Return cooked chicken to skillet and add Cajun powder. Cook and stir for 30 seconds more. Add vegetable broth and tomato juice. Use a wooden spoon to scrape up any brown bits at the bottom of the pan. 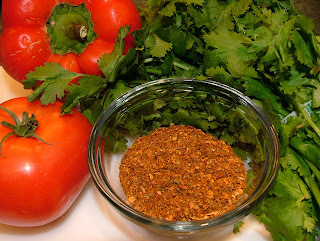 Add tomato and cilantro. Season with salt and pepper. Garnish with green onions and serve. Mmm, I love Cajun cooking. It's funny how the right recipe can take you out of a cooking break! This one definitely seems worth it. Yeah I should really avoid flipping through cookbooks when I want to take a cooking break. Too many interesting recipes to entice me back into the kitchen! Thanks Kaitlin!